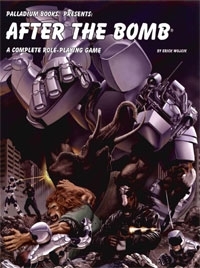 A complete new role-playing game of post-apocalyptic insanity, where intelligent mutant animals have inherited a devistated Earth and humankind teeters on the brink of disaster. Create, design and build your own mutant animals. Optional Human Mutants, who sacrifice their humanity for mutant powers. The evil Empire of Humanity and their canine henchmen. The free state of Cardania and other refuges for mutant animals. The world turned upside down by genetics and madness. Six adventures to get you started, plus random encounters and tons of ideas. Equipment, weapons, skills and everything you need to play, right here. A complete game. Suitable for use with Heroes Unlimited.